Abstract: This project aims to strengthen the competence of Norway as it increasingly becomes a key player on the relations between climate and poverty by improving the knowledge base on Norway’s bilateral relations with South Africa, contribute to a better understanding of the challenges for development aid cooperation to be responsible towards both the environment and the poor and build partnerships with South African scholars and generate possible input for similar debates on the continent. 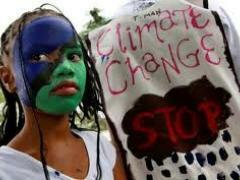 Climate change as a scientific issue is now a widely accepted global challenge. Narratives of climate change are becoming central to development discourse, and increasingly frame understandings of other global challenges, such as poverty and health. In this project, we ask how the new climate change narratives affect approaches and responses to the poor and their rights, particularly as regards their social rights related to resources profoundly affected by climate change impacts such as water and food. We focus our analysis on the international development discourse as well as a concrete country, South Africa, in partnership with scholars who are currently involved in building new knowledge on the issues. This entry was posted in Completed projects, Lawfare from below, Natural resources & climate lawfare on November 29, 2013 by Ingvild Hestad.